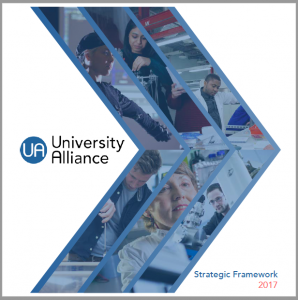 University Alliance represents universities engaged in building the workforce of tomorrow. Together, our members are leaders in technical education; professional training; research and development; enterprise; and innovation. They are civic leaders, with a shared mission to transform our major regions, cities and communities across the UK. They are key to the nation’s industrial base – generating growth, innovation and jobs across the nation. And they work hard to open up equality of opportunity to all, regardless of background, ability and experience. We champion technical and professional education in UK universities – with a tight core of full members, alongside a wider programme membership. We have established a bold reform agenda to create a world-class technical, professional and vocational education system – underpinned with clear analysis and evidence. We have excellent links with decision-makers in government at all levels, which means we can drive policy debate, creation and implementation. Together this empowers, enables and equips our members to face the challenges and opportunities ahead – with our professional networks; collective policy development; intelligence briefings; and event programme, including our annual summit. Our Teaching Excellence Alliance is a collaborative venture which brings together Alliance universities to promote excellent teaching and learning, and to better understand and define – as well as champion and showcase – excellent teaching at Alliance institutions. Our Doctoral Training Alliance (DTA) model offers UK-based PhD students a fully-funded postgraduate programme, an expert support network and improved employment opportunities. The DTA focuses on three interdisciplinary areas: Applied Biosciences for Health; Energy; and Social Policy. It is the largest multi-partner doctoral training initiative in the UK. Our new extended Doctoral Training Alliance (DTA3) opens up our existing doctoral training initiatives to EU and international PhD students – backed by a €6.5million award from the European Commission, under the Marie Skłodowska-Curie (MSCA) COFUND scheme. We are passionate about what we do and ambitious to achieve excellence across our mission. We are open minded and entrepreneurial – willing to consider new ideas, work with partners and to innovate. We provide opportunity for all, embrace diversity, and work openly, honestly and constructively for the good of UK higher education. Read our strategic framework for 2015-2020 here or click on the image below.